The shortest month of the year saw the highest number of job cuts in over three-and-a-half years, as U.S.-based employers announced plans to cut 76,835 positions from their payrolls in February. That is 45 percent higher than the 52,988 cuts announced in January. Last month's job cuts are 117 percent higher than the 35,369 cuts announced in February 2018. 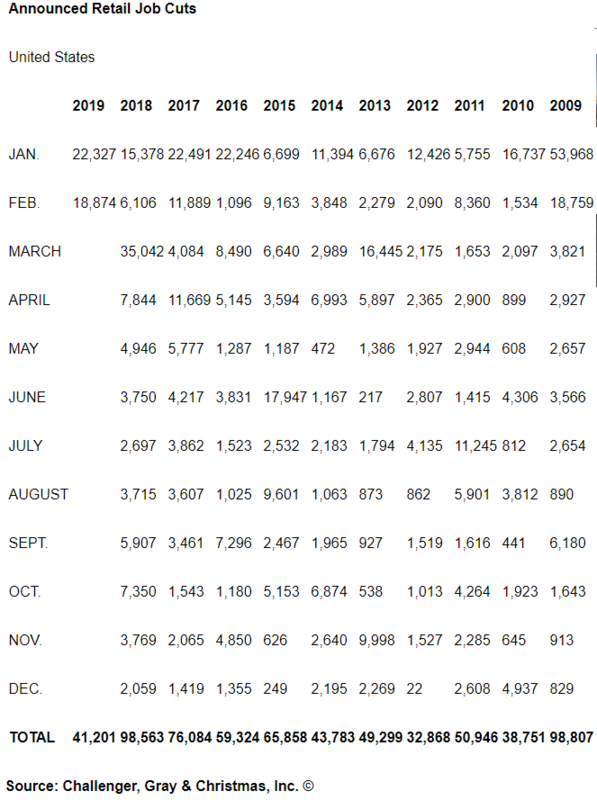 It is the highest monthly total since 105,696 cuts were recorded in July 2015, primarily due to the U.S. Army's cutting over 50,000 jobs and tanking oil prices, causing thousands of cuts in the Energy sector. Job cuts have been trending upward since the last half of 2018. We continue to see companies respond to shifting consumer behavior, new technology, as well as trade and market uncertainty through workforce restructuring. Retail leads all sectors in job cut announcements with 41,201 this year, 92 percent higher than the 21,484 Retail cuts announced through February last year. It is the highest January-February total since 2009 when Retailers announced 72,727 job cuts in the first two months of the year. February's retail cuts include the announcement by Payless ShoeSource that 16,000 associates would lose their jobs as the company closes 2,500 stores. Industrial Goods, which includes heavy and industrial manufacturers, announced 31,948 job cuts through February, while companies in Health Care, including Health Care Products and medical device manufacturers, announced 7,766. Transportation companies have announced 7,193 cuts so far this year. The Automotive sector has announced 7,049 cuts this year, 239 percent higher than the 2,078 cuts announced through this point in 2018. The Auto industry is one in which shifting consumer demand and new tech is creating the need to pivot in a different direction. Tech companies like Apple and Tesla are competing for the self-driving market, causing disruptions to traditional manufacturers and suppliers. The majority of cuts this year are due to restructuring, as companies cited this reason for 42,882 layoff announcements. Bankruptcy has claimed 38,863 jobs so far this year. Technological updates were directly blamed for 1,022 cuts. Companies relocating operations overseas claimed 683 jobs, while tariffs led to 300 cuts.